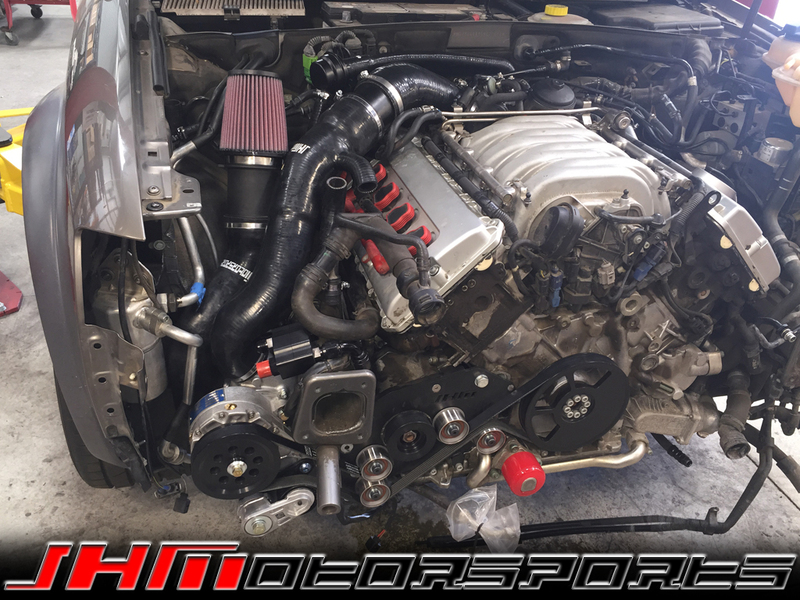 Introducing the JHMotorsports Stage 1 C5-allroad 4.2L Supercharger Kit!!! This is the same kit that was featured on our in-house, record setting 2005 B6-S4 4.2L that ran an 11.96 quarter mile at 116 mph. 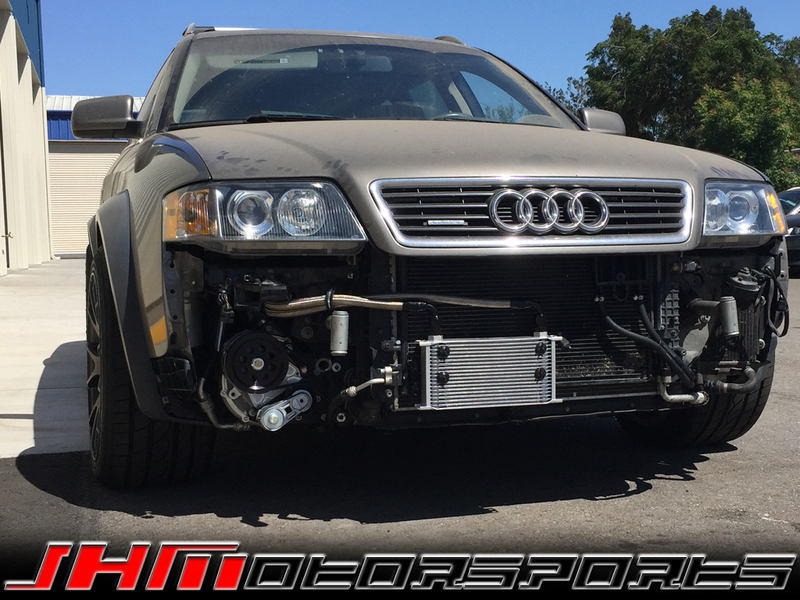 Our JHM Stage 1 Supercharger Kit for the C5-allroad 4.2L will make 80 to 100 wheel horsepower over your car's current configuration. Your current modifications, your dynamometer (dyno) used, temperature, elevation, and octane of gas will all effect the exact amount of power gains. 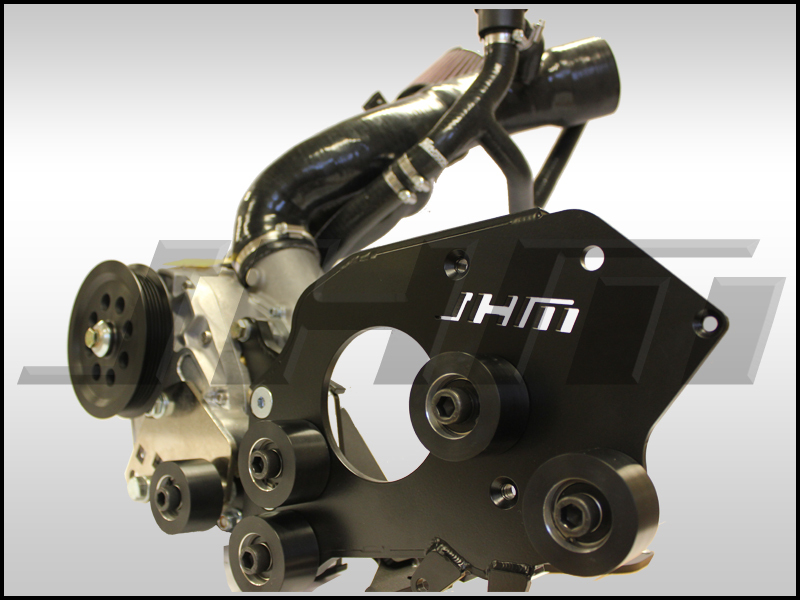 Ultimately, the JHM Stage 1 Supercharger Kit is limited by the rods and pistons in a stock engine, so our kit's current configuration in Stage 1 allows you to make the maximum amount of power without significantly shortening the life of your motor. Stage 2 and 3 of our JHM Supercharger Kit will make SIGNIFICANTLY more power but will require a BUILT motor to handle the increased power. Please contact us for more information regarding a Built Motor for your C5-allroad 4.2L. 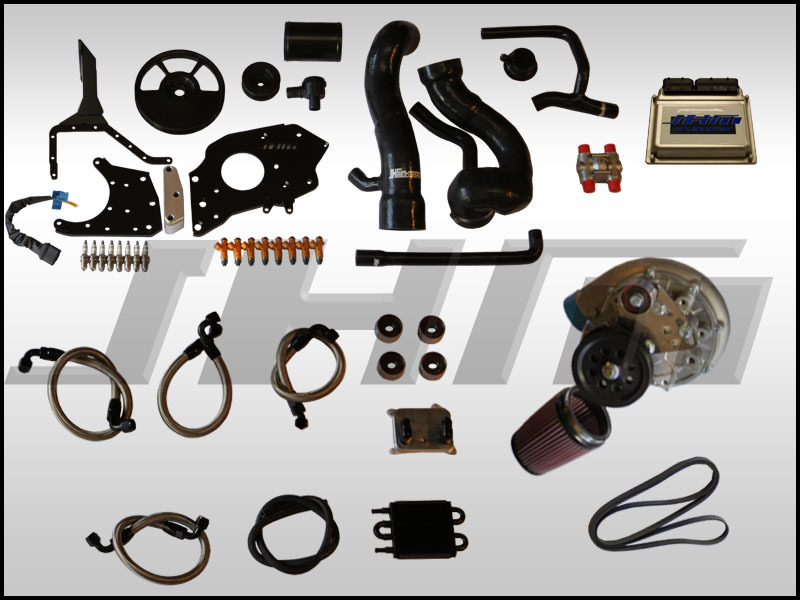 Our Kit features a Vortech Centrifugal Supercharger Head Unit that is good for up to 800 Horsepower! This head unit is a self contained unit featuring quiet, helical cut gears. The only noise you hear from the blower is at idle and low speeds. At wide open throttle, you hear nothing. 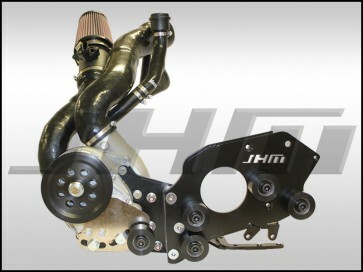 The Kit also comes with our JHM Supercharger Mounting Brackets that we designed and made in-house. These brackets are made from reinforced steel, laser cut, and are powder coated black for a clean installation. In order to insure the longevity and the durability of the belt and pulleys on the C5-allroad 4.2L, when we made this kit we upgraded the belt and pulleys to a 6 rib system with our JHM 6 Rib Accessory Belt Conversion Kit. This Conversion Kit features 3 JHM Supercharger Kit Specific Pulleys including an Alternator Pulley, a precision Counter Balanced Crank Pulley, and a Supercharger Pulley that produces 6 to 6.5 pounds of boost depending on your exhaust system and other modifications. Furthermore, we also include a JHM Belt Tensioner and Rollers. Due to the compact engine bay of the V8 C5s, we had to locate the Vortech Supercharger Head Unit off of the Passenger side of the motor, below the headlight. To do this, we had to create a number of different proprietary parts including JHM Supercharger Kit Silicone Inlet and Outlet Hoses. The Inlet Hose is made from reinforced Silicone to prevent collapse under vacuum and takes in air through a JHM Supercharger Kit specific, K&N high-flow, conical air filter. We also include our new JHM Oil Cooler and Auxiliary Radiator Delete Kit to free up room in the engine bay. This kit includes a custom, CNC machined adapter plate that installs behind the alternator and replaces the OEM Water Cooled adapter. This oil cooler kit is thermostatically controlled with a high-quality Mocal 180 degree F thermostat and includes stainless braided hoses with AN fittings, an upgraded Oil Cooler, Mounting Kit for the Cooler, and an upgraded Power Steering Cooler. 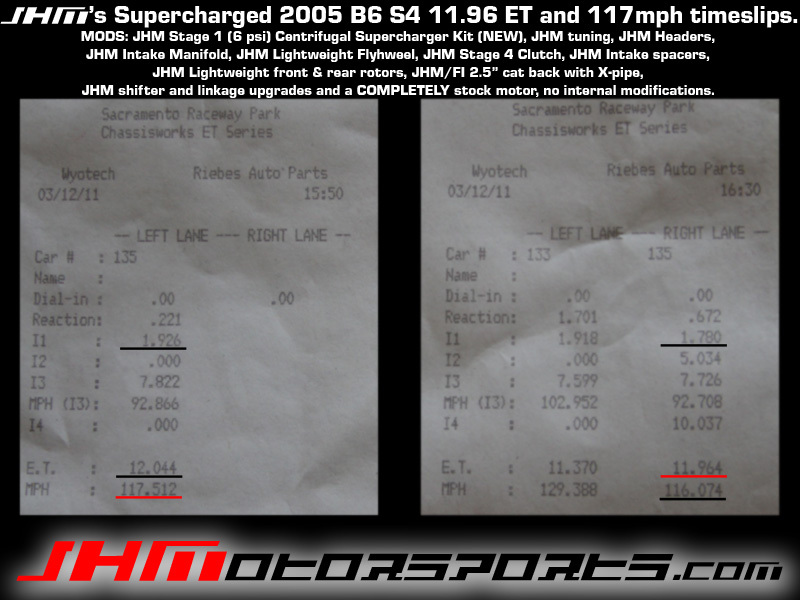 - Vortech Superchargers BLOG: "JH Motorsports Uses Vortech Supercharged Boost to Rocket Their Audi S4 into the 11s..." Click here for full article. - The lower quarter of the core support needs to be removed. - Notching of the bumper support mount points at the frame rail is required. - Clearancing near the passenger side sway bar mount point is required to accommodate the Silicone Supercharger Inlet Hose. - Passenger side fog light will require some small modifications in order to retain the OEM light. - JHM Oil Cooler Kit: If you have already purchased our JHM Oil Cooler Kit, we can remove these items from your JHM Stage 1 Supercharger Kit and discount the price accordingly. Select your preference with the dropdown below and provide your Invoice/Order number from your JHM Oil Cooler Kit purchase in the Order Comments at checkout. 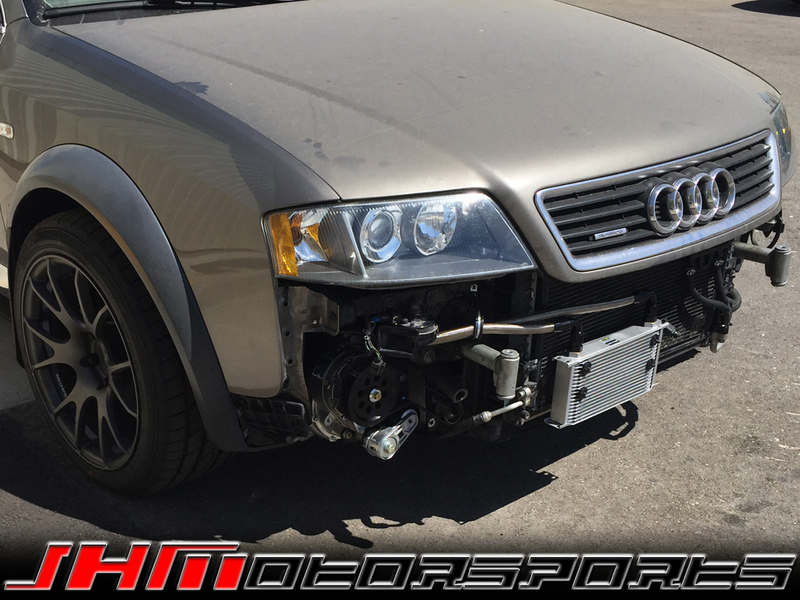 - JHM Tuned: If you are already JHM Tuned and have our ECU Calibration for your C5-allroad 4.2L, we will credit you towards the cost of your JHM Stage 1 Supercharger Kit purchase. Select the option that applies to you and provide your Invoice/Order number from your JHM Tuning purchase in the Order Comments at checkout.